Are you currently employed but are thinking about applying for a position that just opened up in your company? Well, it’s great that you are already employed while looking for work. Even better, you’re applying with a company that you already know and understand because you’re a part of the organizational structure. But wait a sec; don’t get too comfortable. Just as there are some benefits to applying within, there could be a few downsides as well. One big one is that many employees become too comfortable with the application process because they may already know the hiring manager or just feel their status will make them a shoe in. This isn’t always true, however, which is why it’s important to take writing your resume as seriously as possible. Here are some tips to consider that could help you make the most of your resume when applying with a current employer. It’s likely that the job you’re interested in applying for has either been posted on a bulletin board in your building, or has been listed on your employer’s intranet site. This should offer great information to help you determine just what your company is looking for in this position. But because you’re already an employee, it doesn’t hurt to take a stroll down to the human resources office to learn more about the position. You may even be able to find out who the hiring manager is so that you can speak directly with that person about the job. This extra information could help you add specifics to your resume that will allow you to more closely align your skills and accomplishments with the needs of the job. When creating your resume, you want to take it as seriously as you would any resume that you send out to a company. You want to make sure to add all of the important elements (career highlights, job history, educational background, major accomplishments and awards and standout skills). In other words, don’t treat your resume like it’s an unimportant document just because you already have the inside track. In addition, you could ask for help from your co-workers when writing out what you do in your current position. You’d be surprised by what your co-workers might remember that you don’t – or even how positively they view you as an employee. Getting their input could help to enrich your resume and give it the depth you need to show you’re the right person for the new job. 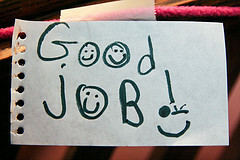 In addition to the standard sections of your resume, another component to consider adding is the testimonial section. These short quotes give hiring managers insight into how others view you as an employer. By getting testimonials from influential leaders in your company, the hiring manager will likely be impressed with who you know and how they value you as worker. Writing a resume for a current employer should be easy to do if you strategize, take the process seriously and gather input from co-workers and leaders in the company who value your work. So show how important you feel this position is to you by working your hardest to create a resume everyone will admire. Resume Writing Services – Heather wants you to user her website to compare the top resume writers in the industry. Will Applying To Multiple Jobs At The Same Company Hurt My Chances Of Getting Hired?